Second only to their botanical cousin, apples, in popularity and production, U.S. pears are grown in California, Washington and Oregon where the peak harvest is during the winter. While the basic shape changes little between pear varieties, differences in texture and flavor affect whether the fruit is served raw, poached or baked. Pears are not allowed to fully ripen on the tree to prevent a gritty texture and produce the best flavor. Their sweet fragrance, delicate floral taste and soft, juicy flesh makes them an ideal choice for all types of winter and holiday meals—appetizers, salads and desserts. 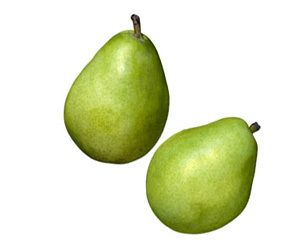 Select pears that are smooth, firm and well shaped with no visible bruises or blemishes. Store unripe pears in the refrigerator for 1 week or at room temperature in a bowl or loosely packed brown paper bag, turning them occasionally. To speed up ripening, add a banana to the paper bag with the pears. Some pears show subtle color changes as they ripen and develop a sweet aroma. To check ripeness, press gently near the stem. If it yields to gentle pressure, it’s ready to eat. Refrigerate ripe pears for 2 to 3 days. Once ripe, pears spoil quickly even when refrigerated. Do not store pears near strong-smelling foods, such as cabbage or onions, since they easily absorb other odors. Just before using, rinse under cold water and pat dry. Most pears are eaten fresh out of hand with or without the skin. Once peeled, use pears immediately as they darken when exposed to air. To prevent discoloration, dip in a mixture of lemon juice and water. When cooking pears, use fruit that is still somewhat firm and not overly ripe. Since pear skin toughens and darkens as it cooks, it’s best to peel the fruit with a vegetable peeler before cooking. When slicing or chopping pears, halve them lengthwise then scoop out the cores and seeds with a small spoon or melon baller. To core a whole pear for poaching or baking (leaving the stem end intact), use a grapefruit spoon or melon baller to scoop out the core and seeds from the bottom. Good source of fiber and vitamin C.
Pears are delectable when paired with certain classic flavors, such as blue cheese, walnuts, pecans, lemon, ginger, vanilla and cinnamon. Substitute pears for apples in most baked desserts, such as pies and crisps. Add the sweet, floral flavor of pears to your favorite fruit or tossed green salads. Serve ripe, juicy pears European-style with a selection of cheeses for dessert. Garnish cheese-topped crackers with thin pear slices for extra-special appetizers or snacks. Sneak some pear slices into a ham and cheese sandwich for a delicious surprise.